“One thing that is interesting to us simple Ramsgate folk is the new 'heritage' street lamps that are going up all along Victoria Parade on the East Cliff. Then there's all that Ramsgate First nonsense about a Parish Council. Everyone knows we'll be lumped in with Canterbury and Dover in a few years anyway, so what kind of say would a parish council have in a mega-council like that? Waste of money. The Victoria Parade Street Lamps that are currently being installed were intitially a response to anti social behaviour around the shelter and gardens near to the Helen Wills memorial. County Councillors Alan Poole and Elizabeth Green persuaded the County to use some of the Thanet second homes money for this. There will also be improved lighting in the shelter and down the steps to the lower prom. I'm afraid that I am largely responsible for the choice of lights, because when I learnt of the plan I persuaded TDC to match the funding so that "heritage lighting" could be installed rather than the standard columns. Because they are primarily intended to light the highway there are regulations concerning "spread" of the light. I will be pressing for the old columns to be removed asap. I am determined that this will just be the start of enhancements to the Ramsgate Eastcliff Prom. Cllr Elizabet Green has obtained a further ammount of money to fund "build outs" from the corners of the roads joining Victoria Parade that will improve sight lines and assist pedestrian crossing. The restoration of the Eastcliff Bandstand project is progressing, with detailed specification of the first phase of the work going to tender this week. The first phase is for restoration of the bandstand itself and installation of sound and lighting systems. Working with the Eastcliff Resident's Association, we are now considering the second phase which is restoration of the surrounding "dance floor". The idea is to bring the bandstand back into use with a variety of musical events. 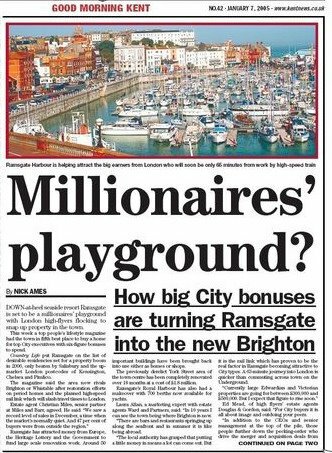 On a broader front,second stage permission for the £1.5 million Heritage Lottery bid for the Ramsgate seafront is due. If succesful, this will provide funds for restoring and improving much of the seafront. Sorry to bang on about Ramsgate, but I'm still waiting to hear if anyone knows where the plans for the remaining development of Granville Court can be accessed online? Cllr Green says 'the west elevation has been approved', but where are the plans, and which bit exactly is the 'west' elevation? And does anyone know anything about the developers, Oakleigh? There's scant info about them on the web, they don't even appear to have a website. It's just that practically every week someone comes along and paints the hoarding around the Granville 'bomb site' and that's all you see of them. The new 'wing' they finished in 2004 looks great, but isn't it about time they did the rest? How do we join the East Cliff Residents' Association? resident needs to go to UK Planning, select Thanet, search applications and enter number 04/0883. The elevation changes relate to both Truro and D'Este Road. I hope this clarifies the postion. I dont have any information on the builders, or when they intend to complete the scheme. Thanks for your help locating those plans, much appreciated.